Our bishop, Most Rev. Gregory L. Parkes, is a very tall man! I got the chance to meet him on Friday night at the conclusion of a triduum for the Feast of the Immaculate Conception at St. Mary Catholic Church. 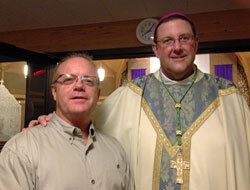 Bishop Parkes was installed as the Fifth Bishop of Pensacola-Tallahassee on June 5, 2012. The feast day we celebrated on Saturday has held a special meaning to me since it was the conclusion of the first time I made my total consecration to Jesus Christ through Mary, according to St. Louis de Montfort. It is a most excellent devotion which I have practiced every year since. In 34 days it’s almost like a kind of personal retreat since it includes daily meditations and prayers. I highly recommend it. An AP article has made a major announcement for the people of Los Angeles. 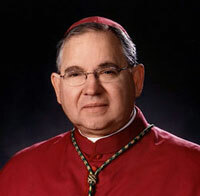 The pope on Tuesday named Archbishop Jose Gomez of San Antonio, Texas, to take over the Los Angeles archdiocese when its current archbishop retires. The appointment of the Mexican-born Gomez as coadjutor for Los Angeles puts him in line to become the highest-ranking Latino in the American Catholic hierarchy and the first Latino Cardinal in the U.S.
Gomez, 58, is a priest of the conservative Opus Dei order. It’s nice to see Opus Dei formed priests in positions like this one. We need more of them!